You’re creating engaging email newsletters, offers and invitations for your audience on a regular basis. What now? To help your email marketing efforts reach more people, you need to continually grow your list. But how can you get people to subscribe to your email list when you’re strapped for time? With VerticalResponse, you can use our free sign-up forms to effortlessly grow your list. 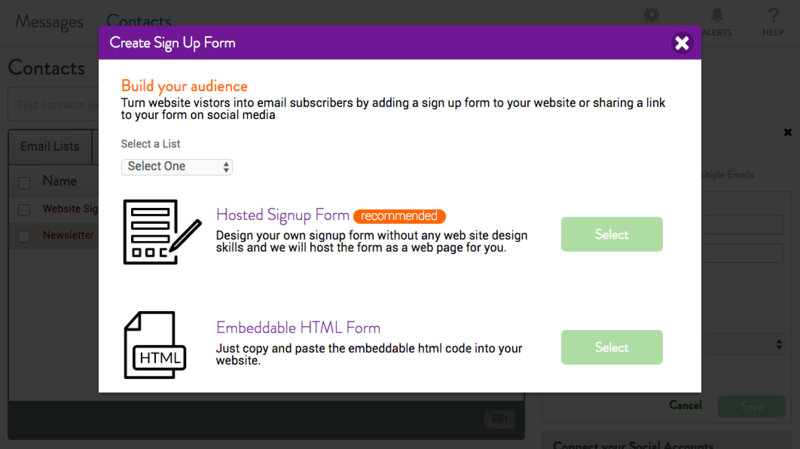 A new window will appear, giving you two options for how you would like to distribute the form: hosted or embeddable. A hosted form will be, as its name suggests, hosted within your VerticalResponse account. Once you’ve created it, you will get a link that you can share with email contacts and social media fans and followers, directing them to the form. One of the benefits of choosing a hosted form is that the design can be edited within the app. After picking a template, add the fields you’d like to collect, such as first name, birthdate and home phone number. You can change the copy by clicking a content block and adjusting the font and paragraph formatting using the “Text Options” toolbar. When you click the “Next” button at the bottom of the page, you will have the option to design a “thank you” page. This is where you — of course — thank your new subscribers for joining your list. 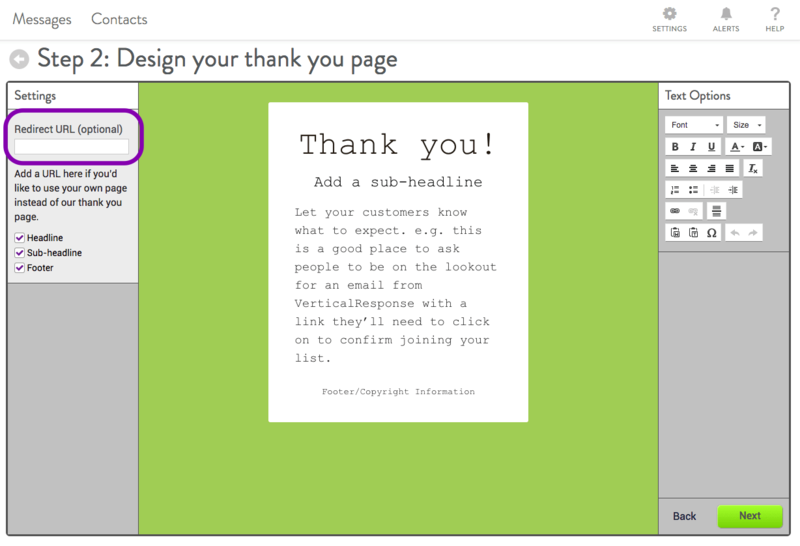 A thank you page is also your chance to let contacts know what to expect from your upcoming emails. If you’d prefer not to have a “thank you” page, you also have the option to direct new subscribers to a website of your choosing. To do this, enter the website URL into the field at the top left corner of the page. An embeddable form lives on your website or blog, making it easy for people to share their information whenever they visit it, allowing you to collect sign-ups anytime. If you would like to add a form to your website or blog, use the embeddable HTML option. 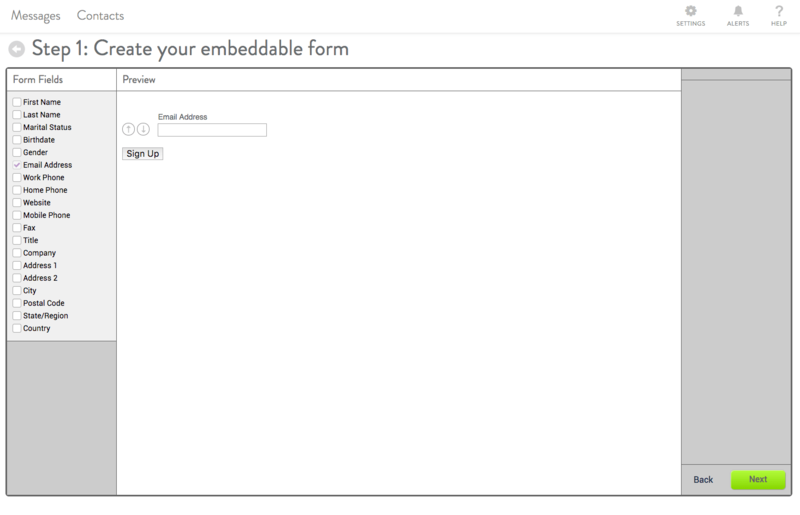 Although the design of your embeddable code cannot be edited, you still have the option to customize the form fields. After you’ve determined which information you’d like to collect, select the corresponding fields from the left-hand side of the page. When you’ve finished, you’ll get an embed code that you can copy and paste into your website. VerticalResponse integrates with many of tools and software programs that you may be using to run your business. Our contact form plugins with third-party products and services enable you to automatically sync new signups to contact lists in VerticalResponse. 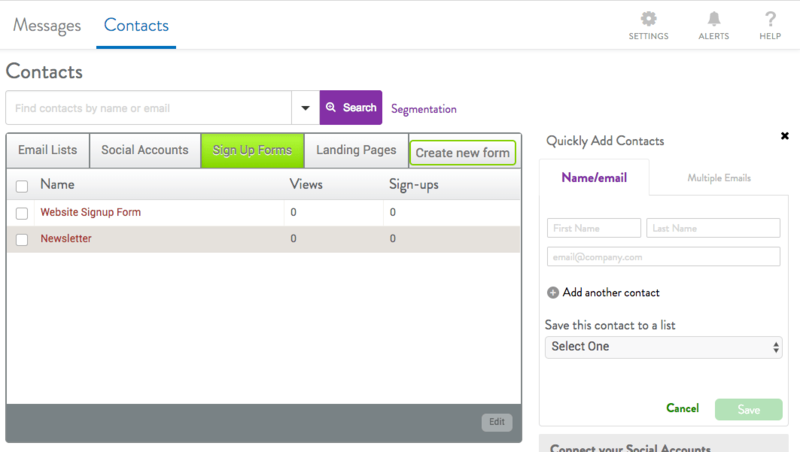 To make lead generation as simple as possible for all of our users, new integrations are always being added. The most recent additions include plugins for Salesforce, Ecwid, Magento, Joomla, BigCommerce and WordPress. After you’ve impressed a prospect online with your products or services, you don’t want to let them slip away. 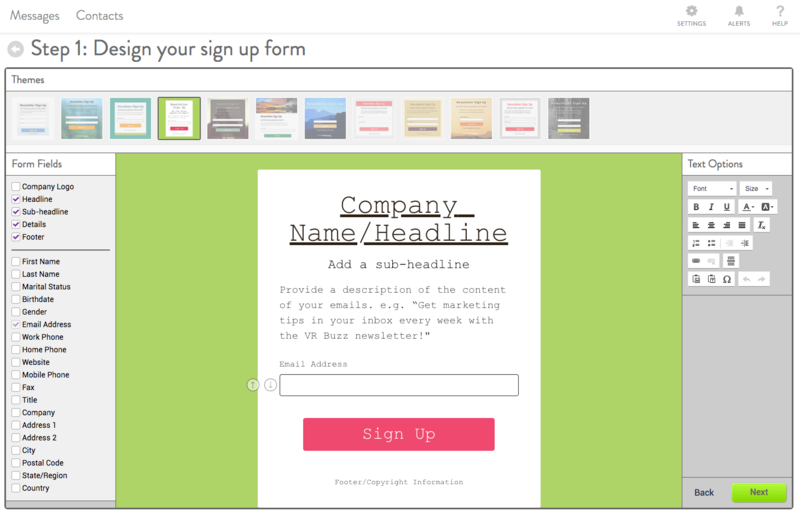 Start creating sign-up forms that help you grow your email marketing program and expand the reach of your messages today. Editor’s note: This article was originally published in July 2014 and has been updated and revised for accuracy and relevance. Thanks for the tips Kim. We’ve tried several tries at both collecting and getting responses or conversions with our email lists on several ecommerce sites with very poor results so we keep looking for good advise to help us with this channel. Create professional email campaigns in minutes.